When dealing with shape optimization we usually need to modify a FE mesh using a few optimization parameters describing the mesh geometry. The B-spline parametrization offers an efficient way to do that. A mesh region (2D or 3D) that is to be parametrized is enclosed in the so called spline-box and the positions of all vertices inside the box can be changed by moving the control points of the B-spline curves. There are two different classes for the B-spline parametrization implemented in SfePy (module sfepy.mesh.splinebox): SplineBox and SplineRegion2D. The first one defines a rectangular parametrization box in 2D or 3D while the second one allows to set up an arbitrary shaped region of parametrization in 2D. where is the degree of the B-spline curve (default value: 3 = cubic spline) and is the number of the spline segments (default value: [1,1(,1)] = 4 control points for all dimensions). where <cpoint> is the index or position of the control point, for explanation see the following figure. The following figures show the undeformed (left) and deformed (right) mesh and the control net. The curves must form a closed loop, must be oriented counterclockwise and the opposite curves (<bspl1>, <bspl3> and <bspl2>, <bspl4>) must have the same number of control points and the same knot vectors, see the figure below, on the left. The position of the selected vertices, depicted in the figure on the right, are driven by the control points in the same way as explained above for SplineBox. Note: Initializing SplineRegion2D may be time consuming due to the fact that for all vertex coordinates the spline parameters have to be found using an optimization method in which the B-spline basis is repeatedly evaluated. 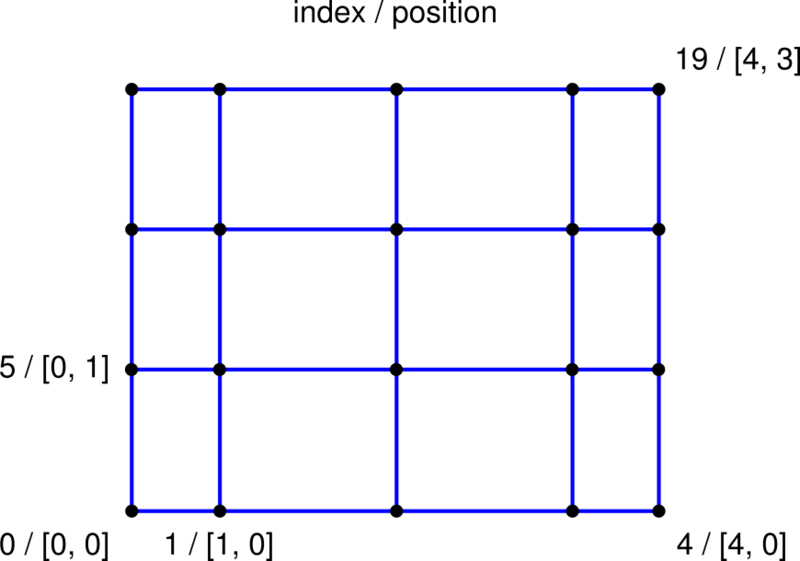 The figures below show the undeformed (left) and deformed (right) mesh and the control net.